This symposium brings together researchers from multiple disciplines for interaction, to help build a compendium of relevant research and identify avenues for research and collaboration on Pinga Oya. Work on other river basins relevant for Pinga Oya are also welcome. The afternoon public discussion is for interested researchers, relevant authorities and concerned citizens. Public Discussion:1.30 p.m. - 3.00 p.m. The technical sessions, in collaboration with a group of academics and professionals who deal on the development of the Pinga Oya, brings together researchers from multiple disciplines for interaction, to help build a compendium of relevant research and identify avenues for research and collaboration on Pinga Oya. The afternoon public discussion,in collaboration with Akurana Women's Welfare Association (AWWA) and Young Friends, is for interested researchers, relevant authorities and concerned citizens. The technical sessions shall be summarized. Ms. Lalitha Dissanayake- Lecturer, Department of Geography, University of Peradeniya and Doctoral Candidate, University of Salzburg, Austria. 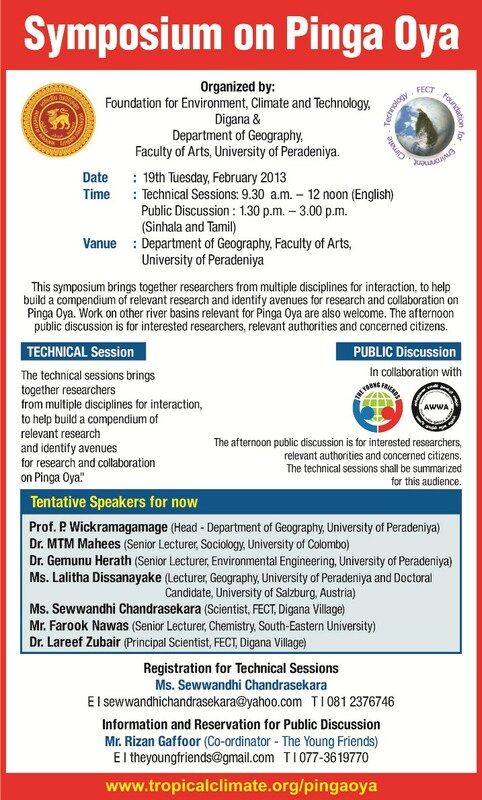 Submit your abstracts by 17th Sunday, February 2013 if you wish to contribute. Also please let us know in advance if you wish to participate in this symposium without submissions. Admission is free by registration. Take the Gampola bus near the main post office in Kandy. After Peradeniya, get off at the “Akbar Hall” which is as alongside the Engineering Faculty (after the first speed bump on the road). Walk (away from Akbar Hall) across the Mahaweli on the concrete bridge – the Geography Department is the first building directly in front of the bridge. Take the Mahakanda, Sarasavi Uyana (bus halts are close to the D.S. Senanayake Library) , Doluwa (bus halt near the Clock Tower) or Deltota (Goodshed) bus which runs on the Galaha road though the University. Get off at the Arts Theartre bus halt just past the University grounds. Cross the road and walk all the way through the path with the tall palm trees that lead to the Geography Department. Take a bus from the Kandy town that runs down the Peradeniya road or Sir William Gopallawa Mawatha. Passing the Dangolla junction proceed about 2 Km. After passing the Peradeniya Botanical Gardens get-off from the bus at the Galaha Junction. As you turn in through the ‘Galaha’ junction at Peradeniya, the road leads to the University of Peradeniya. Walk about 1.4 Kilometres down the Galaha Road. Passing the Medical Faculty, the Science Faculty and the students’ halls of residence on either side of the road, at the roundabout you will come across the university grounds. Close to the grounds passing the small white bridge there is a path on to the right side of the road with tall palm trees that leads to the Geography Department of the University of Peradeniya. From Katugastota town take the Gohagoda road up to Gannoruwa road. Turn to left and proceed to the roundabout and turn to right and proceed towards Peradeniya and turn left on Galaha Road. After about half a km you shall pass the University grounds. Soon after turn right (Arts Faculty sign is here) to a palm tree lined road. The first building on your left is the Geography Department.